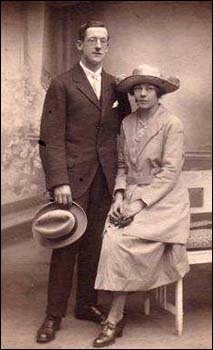 John Stanley Taylor (Stan) and his wife Dorothy died in the Dolgarrog dam disaster, along with their daughter Sylvia, aged 17 months. The photo of Stan and Dorothy (below right) is shown here courtesy of Mark Hughes. On the night of the 2 November 1925, tragedy beset the village of Dolgarrog in the Conwy Valley. Two weeks’ heavy rain had swollen the Eigiau reservoir high above the village. The concrete dam couldn’t cope with the pressure and fractured, releasing a large volume of water into a second reservoir lower down the valley. Just after 9pm the dam at Coedty reservoir burst and millions of gallons of water and thousands of tons of rocks cascaded onto Dolgarrog. Dorothy Taylor, aged 24, was at home in Machno Terrace, Dolgarrog, with Sylvia, who was in her crib. Stan, 29, was out at a Scouts meeting. Without warning the house was engulfed by floodwater. Stan rushed back home and lost his life trying to rescue his family from the wreckage. During the First World War, Stan had served with the Royal Garrison Artillery on the Western Front. 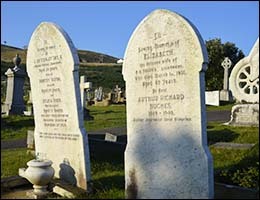 Dorothy’s father was Llandudno journalist and historian Arthur Richard Hughes (buried in the adjacent plot). As well as writing a book on the history of Llandudno, Arthur was a journalist with the Llandudno Advertiser and the North Wales Weekly News. He had the unenviable task of reporting on a disaster which had claimed the lives of his daughter and her family. The Hughes family are one of the oldest in Llandudno, Arthur’s ancestors were bathing-hut proprietors and were involved with building the Marine Drive around the Great Orme. You can read more about the dam failure on our page about the disaster memorial in Dolgarrog.